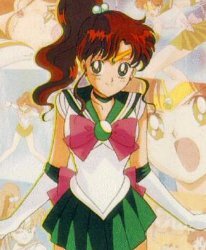 Okay, so how exactly would Sailor Mercury match up to Sailor Jupiter? Well, we put both Sailor Senshi in a high-tech space age computers, and we took the information supplied by us and a special team of animators to come up with the ultimate match up! Unfortunately, the animation would take just way too much disk space, so we have our commentators do it for us. Straight from the Death Buster Headquarters we have Tellu and Viluy! Viluy: Look who's back, kiddies! Mwahahaha! Tellu: Yes, it's Viluy-san, who's just a tad touched since that last virus wiped out most of her memory chip. Viluy: Today's match-up is sniveling little Merc-chan versus Sailor Jupiter, the brute strength behind the Inner Senshi! Haha, maybe Merc-chan will be pounded like a flat potato! Tellu: Let's hope so, because Mako-chan likes plants, like me, so she rules. Let's turn our attention to the field, where Jupiter is stretching, and Mercury is doing something that suspiciously looks like playing Solitaire on her computer... The bell rings, and the match begins! Viluy: Jupiter starts out with full force! A Sparkling Wide Pressure is hurled at Mercury! Tellu: Mercury panics, trying to use her Shabon Spray to protect her! Viluy: Hasn't Mercury figured out that that has to be the weakest attack in all of Sailormoon! Tellu: What about Pink Sugar Heart Attack? Tellu: The Sparkling Wide Pressure flies through the bubbles, hitting Mercury smack in the face! Ouch, she's gonna have burns foreeeeever because of that! Viluy: Scar her, scar her! Go for blood! Beat her into a bloody pulp, Mako-chan! Tellu: Mercury's trying to recover, and in the meantime, Jupiter follows Viluy-san's insane advice and starts doing some weird ninjistu thing on Mercury! Oh! I can't watch, it's too gruesome! Viluy: CRACK! SNAP! BAM! BAM! BAM! KAPOW! SNAP! YES, YES! Viluy: Haha! Look at all that blood... Mercury's face matches her fuku! HAHA! Tellu: Battered and bruised, Mercury stumbles up. In a pathetic attempt to protect herself, she surrounds herself with a water barrier from Jupiter-chan... Oh! What will Jupiter do now! She can't get near Mercury! Viluy: LOOK! LOOK! OH! JUPITER! YOU'RE SO COOL! Jupiter does another Sparkling Wide Pressure at Mercury, and Mercury has apparently forgotten that water and lightning don't mix! Tellu: Omigod! That's horrible! The lightning is spreading through the water, and Mercury's being ELECTROCUTED! Ara, you can see her SKULL flashing as she's screaming! Ewww!! Viluy: Her flesh is melting! Haha! Melt, melt, melt, you wicked old witch! Hahaha! Viluy: And it's over! The battle's over! JUPITER WINS! Mercury's charred corpse falls down into a puddle of water! Viluy: Yay! That's all the time for this month, fellow anti-Mercurians! We'll be back next month with an all new battle in which Merc-chan gets killed again! Tellu: Reminds you of South Park, doesn't it...? Viluy and Tellu: Ja ne!